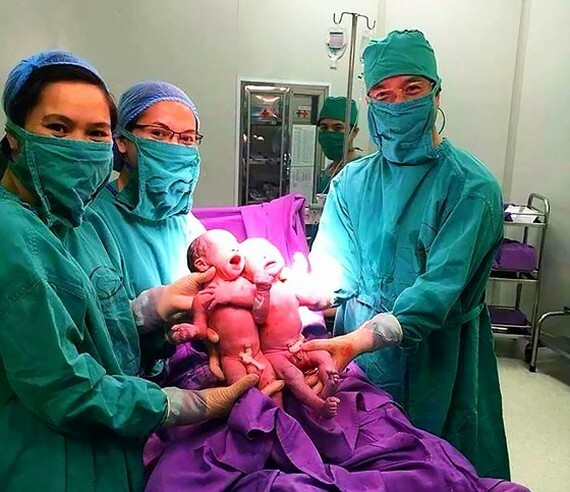 Surgeons of the Maternity - Pediatric Hospital in the northern province of Quang Ninh yesterday performed a C-section for in vitro fertilization (IVF) twins. The 31 year old mother in Ha Long Town was taken in the hospital with diagnosis of 37 week pregnancy of twins. One baby lays transverse; accordingly, she is unable to give birth vaginally. Surgeons decided to perform C-section on her. The operation was a success with two healthy baby boys; one weighing 2,2 kg and the other 2,300 kg. During the operation, surgeons conducted delayed cord clamping during c-section to lower the risk of anaemia and low iron Increases birth weight as well as reduces the need for blood transfusions. Surgeon Do Duy Long, who is in charge of the operation , said the twins are monozygotic ("identical"), meaning that they develop from one zygote, which splits and forms two embryos. The hospital announced one year after establishment, the Reproductive Support Department has provided many services such as consultation and examination for couples before marrying and having baby, treatment for infertile couples, sexual disorders. 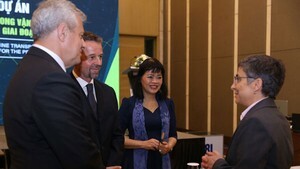 Plus, the hospital has treated more than 300 couples from other provinces; many of them failed in IVF in their local medical facilities yet they had baby after being treated in the hospital in Quang Ninh province.